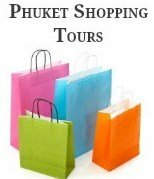 Phuket resorts that offer all inclusive weddings with unique packages to suit all budgets and tastes. With so many beautiful resorts, it's impossible to list them all. 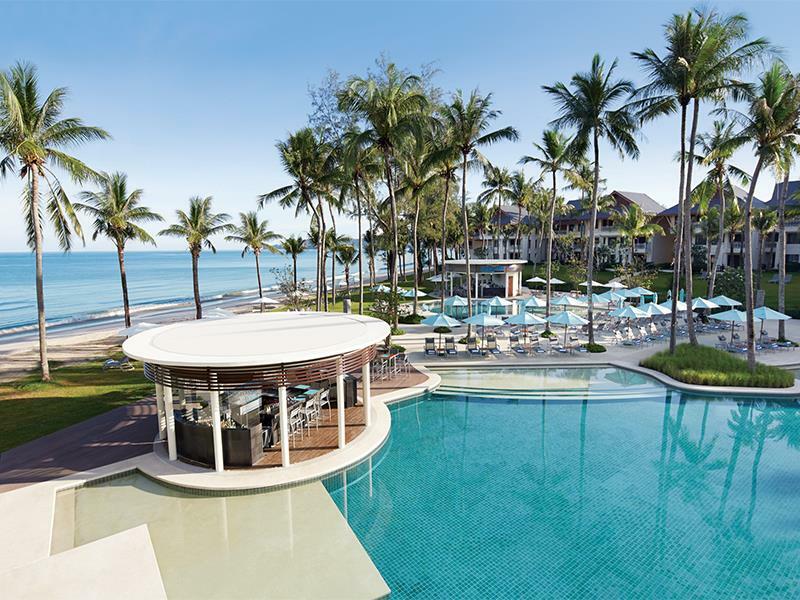 The following resorts are just a handful of the best resorts that offer all inclusive packages for a wedding in Phuket. Prior to booking your wedding ensure that the resort you choose has a professional wedding planner on hand to provide you with all the help and advice you need for your special day. If your resort doesn’t have a qualified or dedicated wedding planner on hand, you can contact our preferred wedding planner who can liaise with the resort on your behalf. You can contact the wedding planner via any of our wedding package pages or in the contact form at the bottom of this page. Wedding planning is fun, but when you choose to have a romantic destination wedding in Phuket, it is best to have a wedding planner to assist you with all your plans. 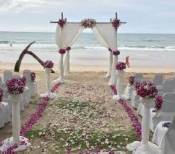 Merlin Beach Resort offers romantic tropical weddings in Phuket. You can select a romantic Western Wedding or a traditional Thai wedding on the secluded and beautiful Tri-Trang Beach. After the ceremony, you can celebrate with family and friends in the resorts garden or in a private setting. Katathani Beach Resort offers all inclusive weddings; choose between a Western and a Thai Wedding, either on the beautiful Kata Noi Beach or a stunning garden setting. Twinpalms provides the perfect Phuket wedding, with a choice of a romantic sunset beach wedding on Surin Beach, or inside the resort, an ideal intimate setting for a romantic Phuket Wedding. 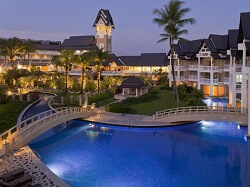 Phuket Graceland Resort provides a choice of Christian weddings or Thai Weddings. With special all inclusive weddings, so you relax and enjoy getting married while the resort takes care of arranging the entire ceremony. Beyond Resort Karon is an ideal setting for a romantic sunset beach wedding in Phuket. 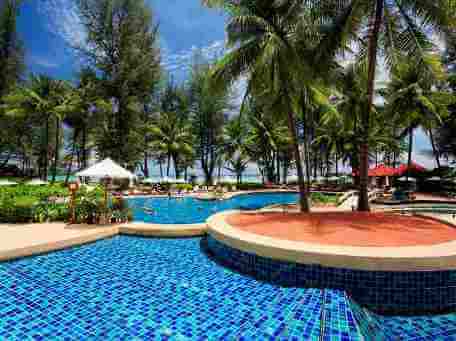 The resort is nestled in the southern corner of Karon Bay. Wedding packages also include a candle lit honeymoon dinner at “On the Beach Restaurant” or a “Honeymoon Love” treatment at the Kanda Spa. The Andaman White Beach Resort is set in a unique beachfront location, a natural setting that will be the perfect background for your special day. You can choose between a Western style Wedding or a Thai Wedding, they also have special all inclusive wedding packages, such as underwater weddings for certified divers. The “Wedding in Paradise” package is one of the best; it includes a beach wedding followed by an exclusive boat trip for the Bride & Groom and their guests, snacks and lunch served on board followed by a gourmet dinner on the beach. This package also includes Thai dancers and fireworks. The Slate Phuket is where you can say your vows against a romantic and beautiful ocean backdrop with a gazebo of roses and orchids. Read more about the Slate Resort. Experience the best of both worlds with a traditional white wedding at Black Ginger, or a breathtaking Thai-style sala over the lagoon. 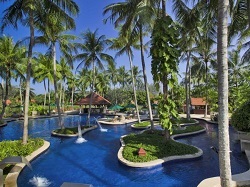 Laguna Phuket is a beautiful location for destination weddings in Phuket. The distinctive Chapel-on-the-Lagoon is exclusively used as Laguna’s dedicated Wedding chapel. This page contains affiliate links, which means if you make a purchase through a link, we may receive a very small commission at no additional cost to you, you can read our affiliate disclosure. All inclusive packages at Banyan Tree are carefully tailored so you can indulge your senses in the privacy of your very own sanctum. Read More on Agoda. At the Angsana Laguna Hotel you can choose from a chapel blessing, a garden feast, or a simple yet beautiful sunset beach wedding. Read More on Agoda. 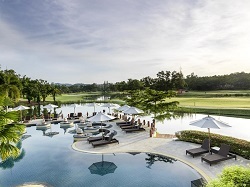 The Laguna Holiday Club is centrally located amongst the tropical surrounds of Laguna Phuket overlooking the Laguna Golf Club's scenic fairways. All suites feature separate living and dining area, convenient kitchens and luxurious furnishings. Read More on Agoda. All inclusive weddings at the Laguna Phuket Resorts, include the use of the Chapel-on-the-Lagoon. The packages of the all inclusive weddings differ in price depending on your budget and the package you choose. To take the stress out of planning your destination wedding in Phuket, you can contact our preferred and most trusted, professional wedding planner in the contact form below. 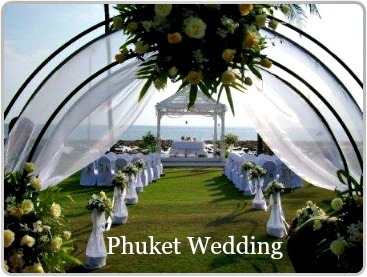 I consent that the information I provide will be passed on to the Wedding Planner in Phuket.